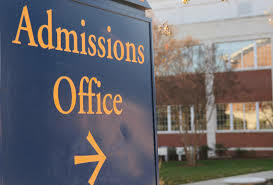 In the Fall many colleges will send a representative from the Office of Admissions to your high school to make a brief presentation about their college. Colleges do this so that they can spread the word about themselves and hopefully find students who would be just the right fit for them. It’s good to be there early so you can get a seat up front and maybe even chat with the presenter a little beforehand. Be sure to put your phone and homework away and make eye contact with the presenter. It doesn’t matter if you’re listening unless they feel like you’re listening, so make good eye contact and don’t chat with friends. If the school has a sign in form, then be sure to list yourself on it. This will add you to the college’s mailing list and put you on their radar. The fact that you signed in goes in your file and acts in your favor. Brochures and pamphlets are great ways to learn about programs the school offers and facts that can help you decide whether or not to add the school to your list. These materials can also come in handy when you are writing your application! Be sure to seem and look interested, and do ask a couple of questions, but let the other students ask questions, too. if you are super interested, stay after. Colleges love to talk to kids who feel like the school is the best fit for them, so if you are really excited, it’s great to show that! Be sure to put your best foot forward, so no clowning around at all, and don’t be sassy or sarcastic. You don’t know that person’s sense of humor and they don’t know you at all, so be totally professional, polite, and positive. Only say positive things. On your way out, whether the school was right for you or not, be sure to say thank you and give a nice firm handshake to the representative. They traveled a long way to meet with you, so show them your gratitude. Thank you means a lot! This is a great opportunity for you to learn about a new college and get the chance to ask questions firsthand from a really nice person who loves to meet teenagers. The people in these admissions jobs choose to be in this role because they love meeting students and talking about their college, so don’t be shy about going to these meetings and staying afterward to ask some questions. Who knows, the next meeting you attend could lead you to your dream school!